Is that old saying and guide of a good size meal is the size of your hand really true? I have always wondered if the old expression “a good proportion of food for every meal is in the size of your hand” Is this really true? Well, in most cases this is generally a guide for people to go by however, some professionals will agree that the serving suggestion in this expression will benefit your health and others will disagree adding that this has no overall impact in your health and wellbeing. This guide has always played a main role in my life and eating habits as it allows me to think about the content of food in every meal and make better choices. For example, when you think of the guide you generally think of Protein, Carbohydrates and Fat or Meat, Vegetables, Carbs. In my opinion by thinking about your choices in each serving you are making a positive step in doing the right thing for your diet and health in every meal. Now I know that not everyone is on the same diet or as I like to call it nutritional lifestyle plan as Vegans, Vegetarians and those who suffer from anaphylaxis and food intolerances will obviously have their own meal plans for ingredients that must be avoided and choices when using this guide. 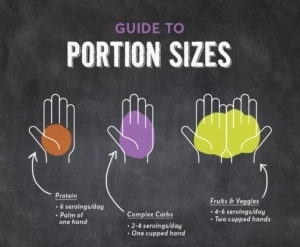 So, with all this being said, I feel the Hand Guide has always had significance to my eating habits and choices as I am conscious of what to eat, quantity of food ingredients in each category compared to other diet plans people have previously used there is no calorie counting or weighing your food and is a guide to a healthy and happy meal.